Promoting scholarly and public understanding of history of science, technology and medicine.Located in the birthplace of American science, the Philadelphia Area Center for History of Science promotes public and scholarly understanding of the multitude of ways in which science, technology, and medicine shape our lives. The Center makes use of the Philadelphia area’s exceptional resources to support research, to foster a vibrant community of scholars, and to build bridges between scholars and members of the general public.Started in 2006 with grants from the Alfred P. Sloan Foundation and the National Science Foundation, the Center is a now a consortium of twelve educational and cultural institutions with significant resources in the history of science, broadly construed. We are bound together by the common belief that our individual resources, if used collaboratively, offer a unique opportunity for both scholars and the general public to advance their understanding of the history of science.Since its inception, the Center has established a fellowship program offering support for research across the scholarly collections of the consortium, created an online search capability which has opened up access to the special collections of the consortium, and has set up and now maintains what has become the comprehensive calendar for all regional events in the history of science. In addition, the Center continues to host both scholarly and public events on the history of science, medicine and technology.The Center relies on its individual and institutional partners for financial, intellectual, and strategic support. We welcome opportunities for new partnerships to pursue our ambitious program as a scholarly and cultural institution, advancing knowledge about our past and contributing to the public discourse about our future. 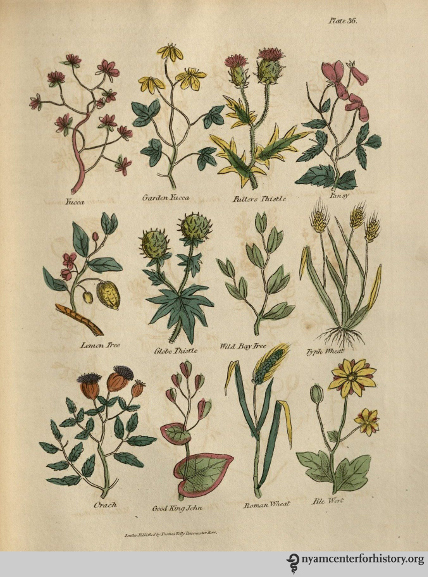 Culpeper's complete herbal by Nicholas Culpeper. Image courtesy of the New York Academy of Medicine.